Train4sure respects and values your privacy. The Company is committed to protecting your personal data at all times. This document shows you how your data is collected and used. When you register at Train4sure, you are required to fill in your email address and password. Remembering your password is very important. Your registered email is your username. You will need this information to login at www.train4sure.com. Please use your current and active email address at which you can be reached. You can change your password in Train4sure Member's Area. You can recover your password (if you forget it) by following the instructions on the website. You should not share your password/website access with anyone. Train4sure holds no responsibility for the damage caused by a missing password which is due to individual mistakes or improper use of Member's Area. Train4sure collects your personal information when you register at Train4sure. To be a member of Train4sure, you are required to fill in the information, including your real name and active email address. The information is collected with the sole purpose of providing our customers with personalized services. When you become a member at Train4sure, we will offer you the following: Exclusive Train4sure Membership Price; insider information on Sales and Promotions; contact details of Train4sure Support Team; Train4sure news. You have given us your written permission to share your information. Whenever, without sharing your personal information, the products and services you need/require will not be possible to offer. The third party, the surrogate of Train4sure and Train4sure offer services together. (After the service, the third party is forbidden to read all the data which is available before the service included). We are forced to disclose your information by law and government authorities. You have violated Train4sure Terms and Conditions. Unless you refuse to receive cookies, they will be sent to your browser and kept in the hard disk of your computer. Like all websites currently, Train4sure relies on cookies to ensure you have a personalized shopping experience when you visit our website. Furthermore, cookies help us offer you better service by analyzing the data. You have the right to choose to accept the cookies or refuse it. Train4sure can trace your IP for the consideration of safety as well as to keep track of installations of our products. The software products of Train4sure can only be installed on two different machines, unless your license states otherwise. If the active IP of users changes frequently, we will reach out to clients to ensure there's no abuse of Train4sure products. 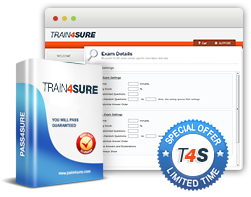 Train4sure uses SSL confidential system to ensure the security of data transmission. Train4sure website and integrated online payment solution requires clients to fill in the information of credit card and submit it to finish the purchasing procedure. All our online payment is accomplished by the third safe payment gateway, therefore, we do not have access to your full credit card information. If our payment gateway judges that there might be some possibility of Credit Card Fraud, you will receive a mail inquiring about the information of your credit card. You should respond such messages immediately. The information you offered will be reserved by us for three months in order to accomplish the payment with the bank. In the meantime, Train4sure ensures that your information won't be shared or exchanged. We will destroy all the information after three months to protect your privacy. Please use the following email address: support@train4sure.com if you would like to contact Train4sure regarding our privacy practices or have any related matters.